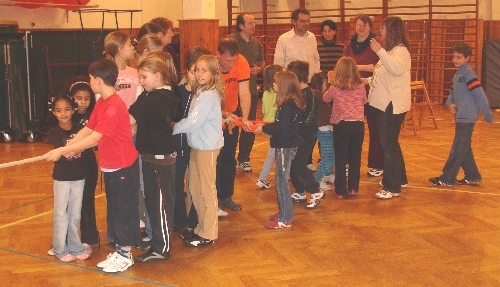 Everybody knows the game rope pulling (“Tug of war”), two teams yank at the two ends of a rope to pull the other team across the middle line. Our Tug of Peace starts like that - and ends completely different! The aim is to enhance the communication and teamwork within the two teams! Everybody has the free choice of the team he/she wants to play for. You can definitely win even if you are in the smaller team with the physically weaker players if your teamwork, your communication and your ideas are better! Besides that another aim is to appreciate the ideas and success of the other team and win and lose in a grand way! The arrangement is: Two teams at the two ends of a rope. Everybody may chose the team he/she likes to belong to. The teams can have different numbers of players and the players can have different physical strength. At the beginning both teams have the same distance to the middle line. Between the teams should be a distance of at least 6 meters. The game aim is to pass the middle line with your own team! The team with the most original ideas (or the most solutions) wins! Find lots of possibilities to win the game – there are plenty! Important: The rope is not allowed to touch the floor. You can even try a variation with three or more teams. Just add another rope at the middle of the first and use the every team has to pass the middle point!